Numaish—Urban Interventions in Public Space consists of over two dozen installations and artefacts created by designers, artists, filmmakers, scientists and engineers. This exhibition traveled to four locations in Karachi during April and May. It is a non-commercial venture and aims to encourage curiosity and elicit healthy exchanges among the people who frequent these spaces. The interventions will be temporary and will not damage or deface the environment. The exhibition opened up public space for cultural production—as an open-air gallery, theatre, laboratory and playground—by highlighting these parts of the city as inclusive urban retreats. Numaish Karachi took place in April and May, 2015 to circulate to four locations in Karachi. 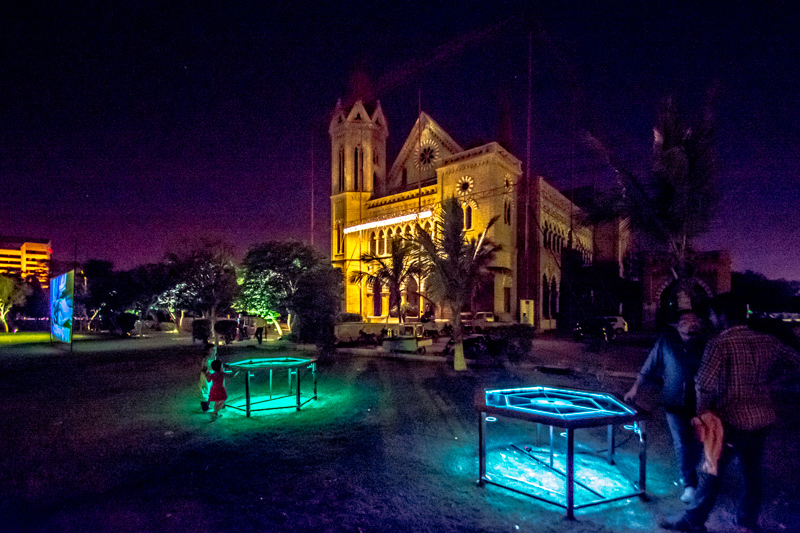 The first venue was Frere Hall Gardens which hosted it for 18 days in April. We are happy to report that a daily fee of PKR500,000 was waived at this site and the venture is taking place in collaboration with The Ministry of Culture, Karachi Metropolitan Corporation.